Ryan Francis Fitzgerald, 40, passed away unexpectedly at his home in Hudson, WI, on Tuesday, January 29, 2019. Ryan was born in Fond du Lac on April 5, 1978, a son of Larry R. and Mary Kelley (O’Brien) Fitzgerald. Ryan was a 1997 graduate of St. Mary’s Springs High School. He attended the University of Wisconsin Eau Claire for his bachelor’s degree in Criminal Justice and then on to the University of Wisconsin Stout for his master’s degree in School Guidance and Counseling. He earned his doctoral degree in Educational Administration from Bethel University, St. Paul, MN. 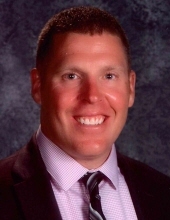 His employment included guidance counselor at Osceola, WI, a principal at Frederic High School, Frederic, WI and at the present principal at Hale Elementary School, Minneapolis, MN. Ryan enjoyed watching and playing many sports, especially mountain biking which took him all over the country where he met many lifelong friends who shared in his adventures. Ryan had great pride in his Irish heritage and in his vocation as a principal. Ryan is survived by Carah, his daughter and the light of his life; by his parents, Larry and Mary Kelley; one sister, Erin (Mike) Mueller and one brother, Kevin (Rebecca) Fitzgerald; nephew Finley and niece Maeve; beloved golden retriever, Patty; other relatives and friends. Preceding Ryan in death are his grandparents. Ryan’s family will receive relatives and friends on Tuesday, February 5, 2019 at Holy Family Catholic Church, 271 Fourth Street Way, Fond du Lac, from 10:00 AM until 11:45 AM. At 12:00 PM a Mass of Christian Burial will be celebrated in Holy Family Church. Cremation will follow these services. A Memorial Fund will be setup by the family and donations in Ryan’s name may be directed to the family. A Memorial Fund will be setup by the family. "Email Address" would like to share the life celebration of Ryan F. Fitzgerald. Click on the "link" to go to share a favorite memory or leave a condolence message for the family.